Casa Palmi is a linear and modern design house just 300 meters from the beach. 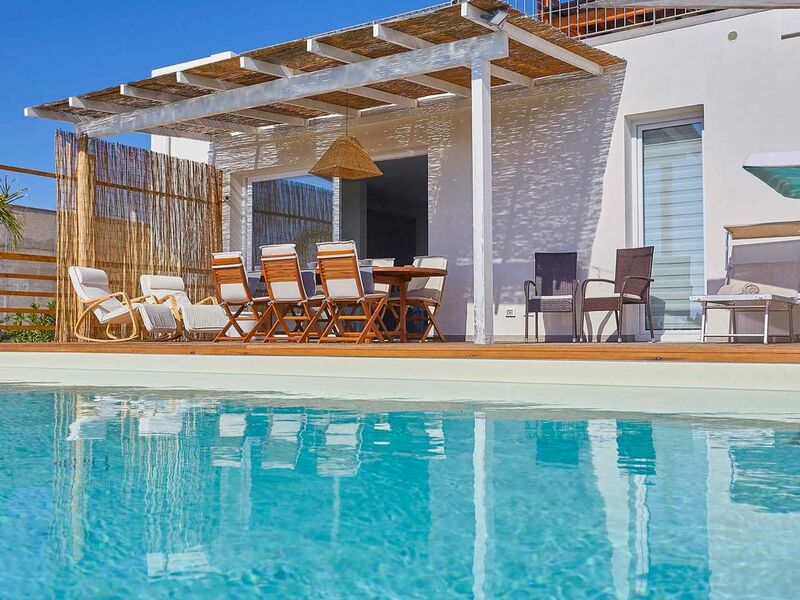 The particularity of Casa Palmi is given by the two beautiful terraces overlooking the sea. On the ground floor of the house there is indeed a spacious private terrace consisting of a covered area furnished with wooden table and chairs, the 4x10 m swimming pool and a comfortable barbecue area, all surrounded by beautiful Mediterranean plants and flowers. Going up a masonry staircase leads to a second terrace also equipped for outdoor relaxation and with an even more beautiful view of the coast. The sea is located just in front of the house, only 300 meters walk, from both terraces you can enjoy a wonderful view and the scent of the sea. The position is really optimal, the long sandy beach of Triscina di Selinunte is only 300 meters away, same distance from the food shops and bars / restaurants. The famous archaeological park of Selinunte is only about 700 meters away, starting from the beach below the house you can walk to the Acropolis area, finding yourself right under the Temple C. All this makes a holiday of relaxation and sea possible without the need to use the car. Inside the rooms are comfortable and well furnished, even the other rooms are nice and welcoming. The property is fantastic. Stayed for a week with family (wife and 2 teenage children) and we were sad to leave. The villa is very well appointed with 2 shower-rooms, good kitchen, BBQ, pizza oven, pool, washing machine and private parking. We spent most of the time at the villa on the outside patio by the pool. 15 minutes away is a lovely beach (down the hill, turn right and head towards the archeology park) with clear water and lots of space. Two minutes away is a fantastic little shop with and a really good take-away pizza place that was very popular with all the local holidaymakers. Selinunte is a 15 minute drive away if you want to visit some very good restaurants (the beach there is much more crowded). We would gladly stay there again. Loved our week here, it has everything you need and more, from the little luxury’s like a welcome pack and Nespresso coffee machine to the comfy beds, and the air conditioning is a must. Check out the pool lights at night awesome. the owner and the property manager are really helpful and respond quickly to any questions. It’s worth hiring a car so you can see all the wonderful history along the coast at Selinunte, and as recommended by the owner take a trip to Erice and try the cannoli in Marsala. Von allen Häusern, die wir bisher hatten, ist es das bisher das Beste ! Wir, eine Familie mit 2 Söhnen, 11 + 13 , haben den Pool genossen, das Wetter hat auch mitgespielt. Die Aussicht aufs Meer zum Frühstück und Abendessen, die Aussenküche mit Grill, der Sundowner auf der Dachterasse, die Pool und Gartenbeleuchtung bei Dunkelheit, einfach eine perfekte Woche.